Unfortunately, many did go after him. Donald Trump won the Catholic vote at 52% , and white Catholics were even more excited to support the Donald, at an astounding rate of 60% . Critical swing states with large Catholic populations: Michigan, Pennsylvania, and Wisconsin, all went red. Obviously, there are many factors in an election. With this we must acknowledge the complicity and empowerment that Catholics have provided Trump in this election. As people of faith, committed to creating a world rooted in dignity for all humans and creation, how are we to respond? The good news is there are many ways, here are a few that come to mind as being especially urgent. Perhaps ironically, the single voter issue that swings the mind of many Catholics is their pro-life belief. What if we expanded our understanding, and were truly pro-life? In support of Pope Francis' call to “welcome our brothers and sisters fleeing war and hunger, violence and the cruel conditions of life” we are planning an Advent action to highlight the opportunity the Church has to welcome refugees through its various vacant properties. 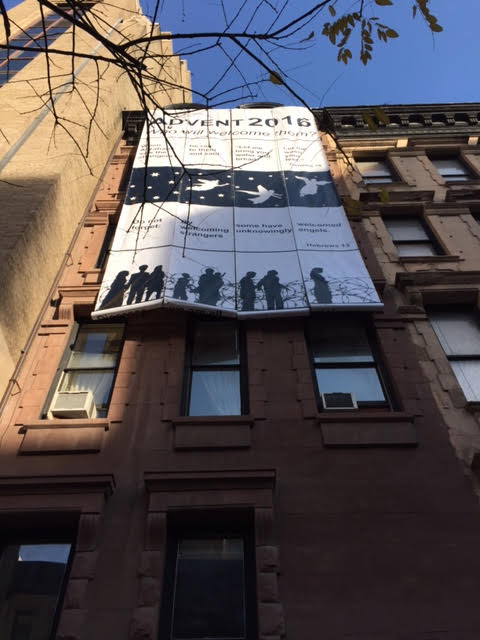 We hope to listen deeply to the call of Jesus to forgive “not up to seven times, but up to seventy times seven!” by supporting, through our organizing space, those who promote restorative justice in the face of mass incarceration, militarization of the police, and the death penalty. When we realize that we are the body of Christ and thereby we are the spirit that make up this church, then the possibilities of how peace and equity can be built becomes wide and exciting. The Season of Advent is upon us--less than one week away!--and Benincasa Community invites you to join us as we prepare our hearts and home to welcome the stranger. Last year at Benincasa Community we immersed ourselves in Advent by challenging the Catholic Church to open its doors for refuge. 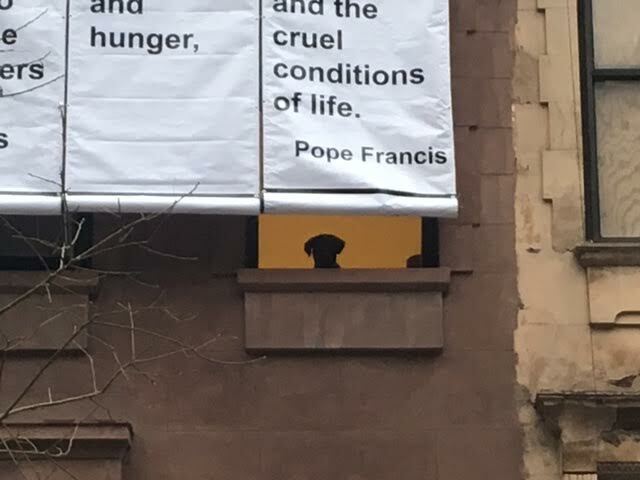 Because the Catholic Church is the largest private land owner in Manhattan and selling its vast stock of vacant property (like hotcakes!) to the highest bidder, we called on Cardinal Dolan to stop the sales and open these doors for housing. 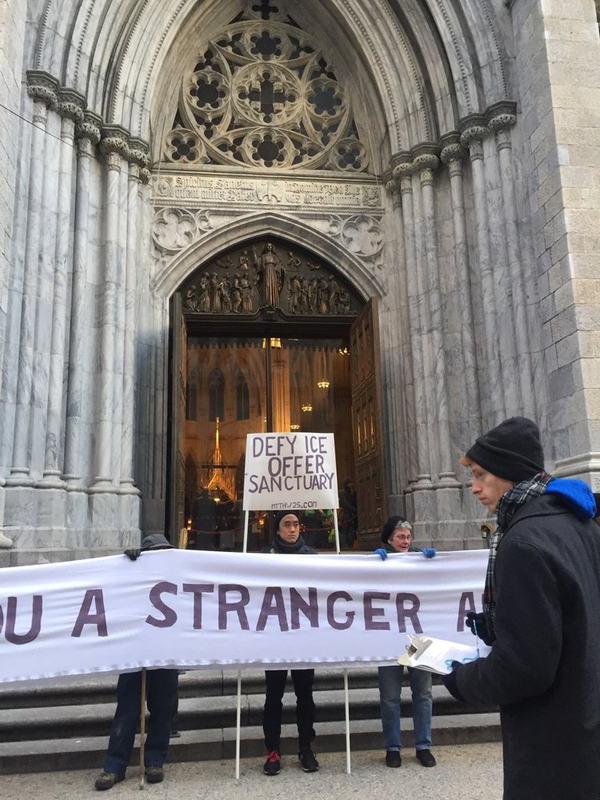 This year we will again call upon Catholics and Cardinal Dolan to use our Church's vacant property to welcome strangers--whether they are our very own neighbors in NYC or those seeking refuge from other countries. This election has highlighted the critical importance of resisting divisiveness, in the Church and world, while building a wider community dedicated to the "good news." Below, Jimmy reflects on three transformative responses to this current moment. We also invite you to join us December 18th, as we come together in song and prayer to more lovingly welcome the stranger. The calendar survived the wind and the rain! And our first full message is revealed! We felt it was critically important to begin the calendar with an inclusive message. 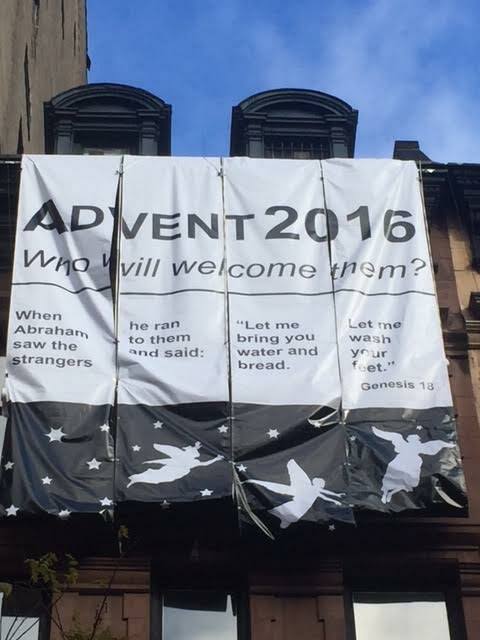 Jewish, Muslim, and Christian traditions uphold this story: Abraham jumped up and ran to welcome passing "strangers". He and Sara offered them food and water and to wash their feet. These three "offerings" are repeated throughout scripture and in our holy texts. Give drink to the thirsty. Give food to the hungry. Do not consider yourself better than any one else. The three strangers--of course--were angels in disguise and, in reward for Abraham's and Sara's kindness, they deliver this miraculous message: The couple will give birth to a child, despite their old age. This week Laura's hand-drawn angels descend! They are, indeed, the three angels who visited Abraham and Sara. 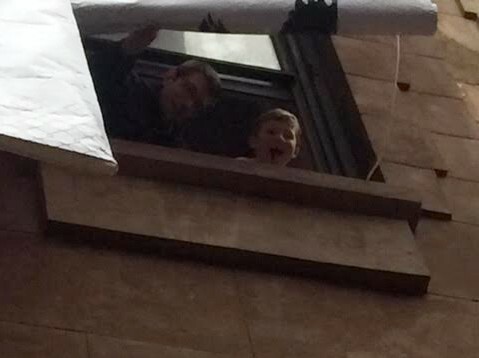 They also remind us of all the angels who have brought "glad tidings" throughout the centuries. If we are a people of faith, we must believe in miraculous births and miraculous re-births. We must look for and celebrate all that is impossibly good all around us. This week we reveal a passage from St. Paul's letters. The statement is part of St. Paul's closing remarks. It is written to his beloved community as a last loving and stern reminder. It's like our last words of encouragement to a friend before a job interview: "Don't forget to be yourself!" or the last words of advice to students before an exam: "Take your time and do not forget to check your work." Before signing off, Paul reminds his friends (who undoubtedly knew the story of Abraham): "Do not forget that by welcoming strangers some have unknowingly entertained angels." Let us, like the very first readers of St. Paul's letters, be encouraged by and take heed of his good advice. When offering hospitality we see a glimpse of the Divine and ourselves become more angelic. This week we revealed an image of people living in advent, i.e. waiting and preparing in hope for safety, joy and peace in their lives. Nearly 1 in 100 people worldwide are now displaced from their homes, the highest share of the world’s population that has been forcibly displaced since the UN High Commissioner for Refugees began collecting data on displaced persons in 1951. We, as a community, are pondering this question: "When did we see you a stranger and welcome you?" He could not be more direct with us, or more encouraging! Benincasa Community sends Light & Love to you and yours on this darkest day of the year! We organized a program of movement music and traditional carols written on the theme of "welcoming the stranger", in order to draw a correlation between the christian season and politics of greed and individualism. 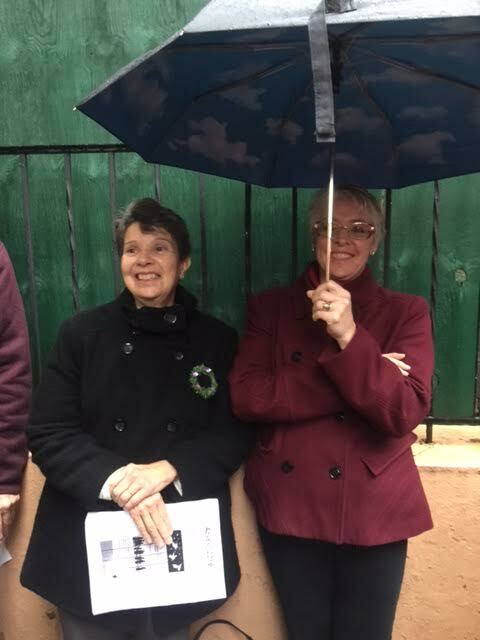 The day was met with rain and high spirits when over 70 people gathered for the event to sing and strategize for the growing resistance. 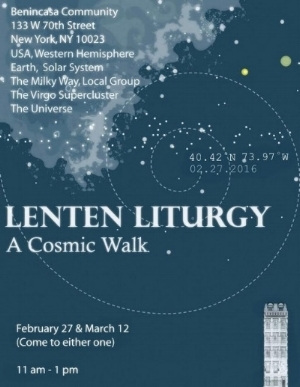 During the Spring of 2015, Benincasa Community organized and hosted a Lenten season liturgy incorporating the 14 billion year old "Cosmic Walk" with themes of co-creation and renewal in a world broken by humanity. Below is an excerpt from the program and a picture of the Cosmic Walk where one step on the rope represents 100 million years in the story of the Universe. Each year at the beginning of Lent we reflect upon the phrase: "Remember that you are dust, and to dust you shall return." The Cosmic Walk teaches us that all life is - actually - made from the same matter - the same stuff. We are, in our DNA, so very similar, branches from the same tree of life. Our faith tradition echoes and reverberates this truth. It is God’s wish that all life is unified - that we recognize our common lineage. Story of Ruth ("Your people shall be my people, your G-d shall be my G-d") Beyond culture, beyond prescriptions and norms, we are family. Psalm 133 - Aaron’s beard: How good and pleasant it is/when God’s people live together in unity/It is like precious oil poured on the head,/running down on the beard,/running down on Aaron’s beard,/down on the collar of his robe. / It is as if the dew of Hermon/were falling on Mount Zion./ For there the Lord bestows his blessing,/life forevermore. The Central message of the Gospel - Love your neighbor as yourself. Letters from Paul to the Corinthians 5: "So we, who are many, are one body in Christ, and individually members one of another." And So: Our VERY recent scientific discoveries (The Cosmic Walk) and our faith tradition proclaim: We are from the same dust. We are one. We must act as one. Remembering that we are dust may seem simple enough, but let’s now pause that we might TRULY remember. It is in the remembering -- the RE-MEMBERING, the joining of members, that we are transformed again to dust -- returned to the place of unity, restored to the Kingdom, connected at long last to the Source of all being from which we came. During Lent we are called to remove all that divides us, keeps us self-centered rather than other-centered. We are invited to transform our understanding of “the other” into an understanding of “the brother”, literally meaning a member of one clan or family. We invite you now and for the remainder of these 40 days to work towards reunification with nature and other people. -- When can I find moments each day for silence and solitude, to make space for another voice to be heard, to resist a culture of noise and constant stimulation? -- When and where do I welcome the stranger? -- With whom can I cultivate community? Who should be my mentors? Who do I mentor? -- How can I become more aware of my kinship with creation? -- How can I commit to bringing myself fully present to the work I do, whether paid or unpaid, holding a heart of gratitude for the ability to express my gifts in the world in meaningful ways. -- How can I keep holy and restful the Sabbath? -- How can I commit to a lifetime of ongoing conversion and transformation, recognizing that I am always on a journey with both gifts and limitations?